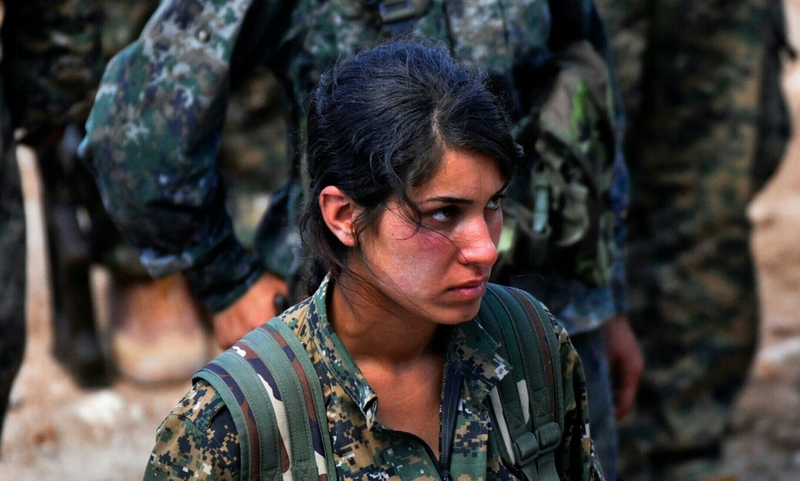 A Kurdish soldier in Syria. Kurds make up twenty percent of Turkey’s population, and they are about 40 million strong within their stateless region. They are a distinct group of people with a distinct language and have large populations in Iran, Iraq, Syria, and Turkey. They have faced a huge amount of persecution within these countries for years; particularly now in Turkey. After the breaking of a two-year ceasefire between the government and the PKK, many Kurds in Turkey are being caught in the crossfire and face a new growing threat of harassment. These airstrikes bring into question Turkey’s true intentions in their operations. For nearly two years, the Turkish army spectated the war from across the border, but after the first targeted bombings on ISIS positions in July, the situation changed drastically. “ISIS and Turkey had a nearly two-year-long Cold War in which they avoided fighting, with the knowledge that their confrontation would lead to destruction on both sides,” said Soner Cagaptay, director of the Turkish Research Program at The Washington Institute. Due to Turkey’s hesitation to submit to conflict, many criticize Turkey’s operation, and believe its desire coincides with internal political considerations rather than just eliminating the threat of ISIS. Many argue that their operations are to simply please the international community and to target the increasingly hostile Kurdish fighters. According to Time, some analysts even speculated that Turkey might prefer ISIS to an independent Syrian Kurdish state on its border. The PKK’s affiliate in Syria, called the People’s Protection Units (YPG), are proving to be one of the only forces hitting ISIS head on with relentless force. Therefore, if Turkey is damaging their support from the PKK, then it not only weakens the opposition on the ground against ISIS, but it also complicates this increasingly complex war. Who is the real enemy? Who supports who? Regardless of these complications, if Turkey’s operations are successful, we will see a rise in Turk nationalist voters who will lend their support to the AKP, the party currently in power. The party has an anti-Kurdish principle, which it will promote increasingly towards the upcoming elections. By awakening a violent uprising between the PKK and the Turkish state, Recep Tayyip Erdogan, the current president of Turkey, has paved the way for a new conflict that will affect the status of any pro-Kurdish parties in the approaching November election. Also, by joining the US-led mission against ISIS, the Turkish government is able to make attempts at controlling the growth of Kurdish power, which is becoming more influential in the area. Turkey can also create safe zones close to their border, which will refrain Kurds from advancing in this area. It is important to note here, that these operations can easily backfire by both weakening Turkey’s international reputation and internal government support. US concerns arise amid Turkey’s role in the conflict, but it stresses the importance of Turkey’s participation in general. Turkey has a well-equipped and strong military unlike most of the regional allies of the US. Its proximity to ISIS location is also very advantageous. However, its current paradoxical role does not fulfill its full potential. Turkey has the power to make a significant change in the war, but has not yet employed it. In future activities, Turkey should focus on improving relations with the PKK and creating a new ceasefire deal. The threat of ISIS is much more important to counter in the eyes of the rest of the world, and the anti-ISIS forces don’t need a double-fronted war in this ever increasingly complex conflict. All photos courtesy of Flickr Creative Commons.